You know how life so often hands us a lemon and we get to figure out how to make it into lemonade? Well, I think this is a great story of just that! While grocery shopping, I saw a big box of very pretty cupcakes marked down. It was so much less than I could make them for, and I was having company for dinner. I bought them and oh so carefully nestled them into place for the ride home, thinking I'd embellish them in some way to make them special. When I got home, it looked like I had been demolition driving with a heat lamp over them! I knew I should take a picture, but I didn't. As I looked at them, knowing I didn't want to serve that mess to company, the lemonade solution came to me. What was I seeing? 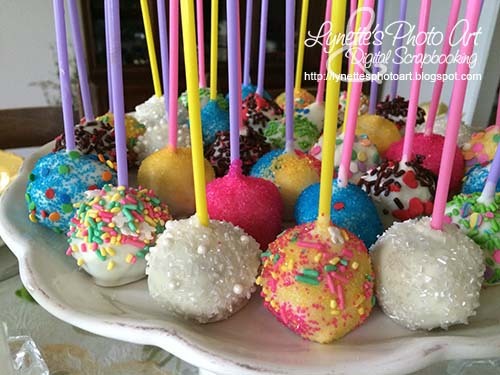 Cake...and frosting.............. CAKE POPS!!!! Why not? 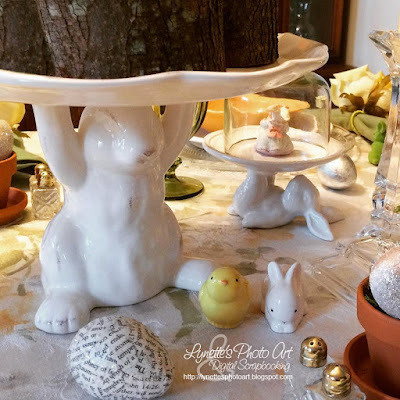 The big bunny pedestal is a new gift from my daughters from Pier 1. I have been soooooo wanting him to go with my Pottery Barn bunny cupcake pedestal that I've loved for years. I'm so excited to have them and so grateful! Doesn't he look perfect holding the cake pops? They go so perfectly with my daughter's Easter plates that I just found this afternoon. They were among things she never took with her when she moved out. :) It all couldn't have gone together better if I'd planned the entire thing!!! The cloche on the cupcake pedestal is from Home Goods. 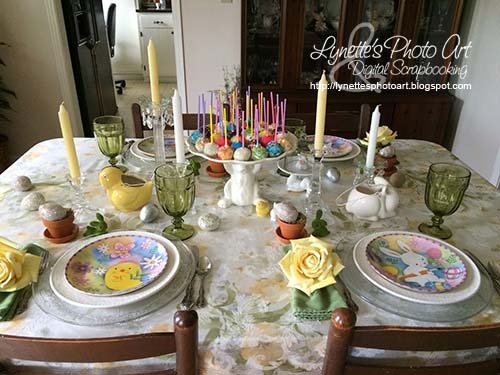 The ceramic chick and bunny baskets and matching salt and pepper shakers are Hallmark, bought from Kohl's. The tablecloth, (my favorite!) was from Bed, Bath & Beyond. The gorgeous crystal chargers were from Hobby Lobby (not actually chargers, but on clearance as the last remaining pieces of three tiered servers). The eggs were paper maché from Hobby Lobby too. I covered some with old book pages and mod podged diamond dust on them, painted some silver, some were left plain and some with only diamond dust. I love them all! A very easy project with a BIG payoff in person! The moss filling the clay pots is from there too. The glasses are Libby's Gibraltar from Walmart as are the napkins and candles too. 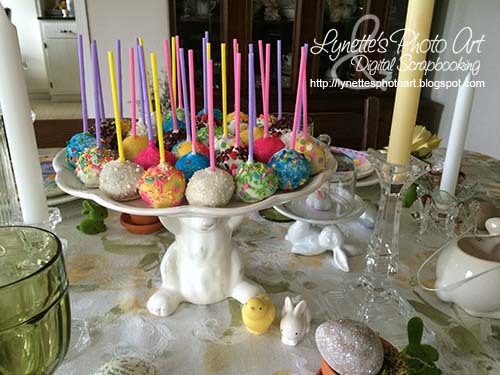 The tiny clay pots and the flocked green bunnies were from Michael's. I think the Easter plates were from Cracker Barrel. The napkin ring roses were from MacRae's. The flatware is Oneida's Michelangelo, also gifts from my wonderful daughters! That just leaves the white basket weave plates. They were from an outlet store in Nashville that no longer exists. The candlesticks were from Service Merchandise and the candles from Walmart. He's holding pillars we cut from our much loved Bradford Pear tree that fell this time last year. Also, some wild flowers. 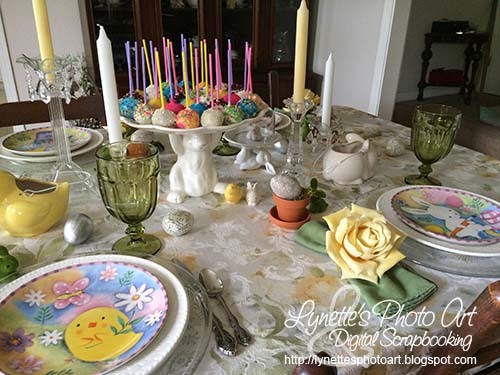 It went with the spring garden motif of this tablescape. 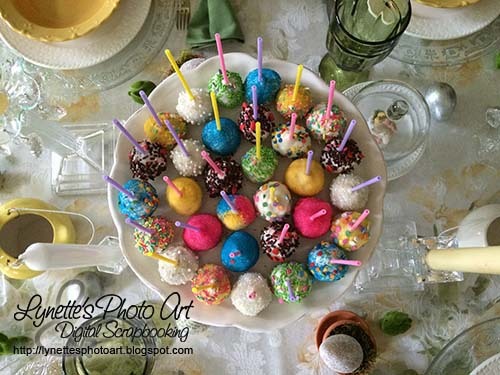 BTW, If anyone wants to follow me on Instagram, my name is "lynettesphotoart" - LOL, big surprise huh?!?!?! Thanks for dropping by and hope you enjoyed your glass of lemonade!!! God bless you and yours! This is such a funny story and such a shocking surprise! I hope you'll read on and enjoy the journey with me. It's all good - really! We all know that some things will change as we age. We've seen it in those around us. We've watched it on TV and in movies. It's no surprise...but there is a BIG surprise here! However, I have run into a "change" that I have never heard of and would never have dreamed of and it's turned my world up-side-down! One morning a few weeks ago, I woke to find my hair was one solid MAT from my ears to my waist! I don't mean tangled, I mean a solid mat like behind your dog's ears! I've never had even a tiny one before. And so began my journey of discovery. It turns out that EVERYTHING I have ever done concerning my hair was monumentally WRONG! Who knew? Thank God for the internet and so many people sharing knowledge!!!! As I said, it was a SOLID mat, like in FELTING! After all normal efforts failed to return it to HAIR, I thought, THE SHOWER! The running water will help me untangle it and I can slather all manner of conditioners and oils into it! That'll do it! I even grabbed my giant jar of coconut oil and brought it with me. Water made it worse (as I later learned on-line). No hair product made any difference at all. I turned to the coconut oil as a last resort. I knew it would be solid as the house is cold, but I didn't realize it would take a chisel to chip any out of it at all! I tried to melt chunks in my hand, then worked it into my hair. I put so much in, but it made no difference at all. I worked on it until I ran out of hot water!!!! For TWO DAYS I worked on it! Yes! TWO DAYS! I toyed with the idea of calling a beauty parlor and asking what they'd charge to "comb my hair", but their shrieks of laughter filled my imagination. I gave up and did the unimaginable...I phoned my grown daughter in a neighboring town and asked her to "come comb my hair"!!!! The irony was not lost on me! All those years I cared for her gorgeous waist length hair and now I'm asking her to make a trip JUST to COMB MY hair! LOL! Was this the start of my second childhood??? Bless her heart, she came right away. I had managed to move the mat from my ears to my shoulders, but all the rest was still solid. I told her she could just cut it off, but she wouldn't. After she'd worked on it for a very long time, and worked tons of coconut oil into it, I thought to ask for a photo. It took forever, but in the end, she only had to cut off a few inches. When dried, it looks much shorter. I am FOREVER grateful to her!!! Thankfully, God has given me a fantastic daughter who rescued me! You need to know that we keep the house veeeeery cold in the winter to be able to pay our heating bills. My daily attire includes boots, many layers and usually a coat. Sometimes I also wear a hat, scarf and mittens (with the fingers open so I can work). All that to explain that at night, I often wear a hat and scarf...a black fluffy scarf. Yep! My hair started thinning horrifyingly a couple of years ago. All of a sudden when I looked in a mirror one day, I could see through my hair to behind me. The doctor and hair dresser both said it was my imagination. No. I was never able to see behind me in the mirror before. It's awful. I started scarfing Biotin. I don't know that it helps at all, but I still take it. We all know hair thins for most of us as we age. Still cruddy when it happens! In recent months, my hair has been becoming more tangly. I've never really had a problem with tangles before, even when I had a long, very curly perm. Oh it was so beautiful, but too expensive to keep perming. Oddly, I never had tangling or needed extra products for it? Say, if you look at the bottom of the right column, there's a picture of me and my baby Muffy when I had that perm! Back to "recently" - first I had to stop using a brush, then I started using a really wide toothed comb and my fingers to finger-comb. More recently I'd been having so much trouble with tangling when I washed my hair, that it had become a real chore. I dreaded washing my hair now. It was a BIG, exhausting job! It was also not good for my thinning hair to put it through all that trauma every time. I want to KEEP every strand I have!!! It got so bad that, though I felt silly, I went to Walmart and looked for a detangler in the ethnic isle. Silly because I'm about as white as you can be and felt out of place there. There were SO MANY and pricey too! I ended up actually seeking out a black female employee in the hair care department to ask for recommendations for a detangler. She sent me home with a baby detangler that I was trying, but it wasn't really helping. I had been very loosely braiding my hair for sleep, to keep it controlled and make sleeping easier (pulling etc.). That didn't last long though. Soon I couldn't separate my hair into three sections TO braid it! I went back to just leaving it loose. Two nights before the hairmare I had thought, hmmmm, if I wear my neck scarf OVER the hair (instead of under) to sleep, maybe that will control it. The first night went fine. The second night...behold the felted head!!! She was finding bits of that scarf matted into my hair nightmare!!! Once she had me combed, I was afraid to go to bed lest it happen again. I stayed up all night researching "how to sleep with curly hair" on-line to try to avoid a repeat! I have always had loose waives and tight ringlets at the nape of my neck. I never would have thought of myself as "curly". 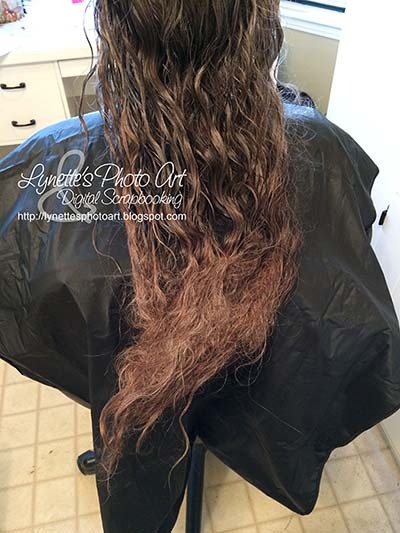 Since the top layer of my hair was always loose waives, and the underneath only a little more wavy, the ringlets at my neck seemed out of place. As I read and watched videos, I learned everything I have ever done with my hair was wrong! Pieces started fitting together. I remembered that the few perms I had through life always resulted with shocked hairdressers and me dubbed "poodle woman" by my girls. When mouse and "scrunching" hit the TV, I found it gave me much more pronounced waives, but still didn't think of myself as "curly". But here is the shock on "changes as we age" ... this last year, less actually, I have been getting more and more CURLY! Under the blah top layer, I now have coils way too tight to insert a pencil into. A doctor said hormone changes cause some women's hair to get curlier with age. That can't be it for me as I had a full panel done just months earlier that showed there isn't a measurable speck of Estrogen in me and almost no Testosterone (yes girls, we are supposed to have a healthy chunk of that too, just not near as much as men). So it's not a hormone change making me more curly. I'd thought that maybe with less hair weighing it down (the thinning), more curl was showing. I still don't know. It's a MYSTERY!!!! I have learned a lot on line about curly hair and here is some of it. I hope it helps you. There's a whole new vocabulary for curly haired girls, plopping, clumping, defining, co-wash, no-poo, pineapple, etc.!!! You need to give up everything you thought you knew about hair care and be open to new ways. All curly hair is different. You need to experiment to find what works for you. The tangling is due to the curling. Everyone sheds 80-100 hairs every day. Straight hair falls out freely, but shed curly hairs get stuck in our curls, contributing to matting. When detangling, we are working the loose hairs out of our curls. The frizzing is due to dryness, even if your hair doesn't appear dry. Sleep on satin pillow cases to reduce friction as curly hair is fragile. For many, sleeping in a "pineapple" helps. That's pulling it all on top and loosely banding so you aren't rolling around in it as you sleep. Mine didn't work well this way as it's so very long, fine and thin. I don't have the volume to make it work well. Brushing for most is a bad idea. Wide toothed combs and finger combing are good. Yeah! At least I had finger combing right! Never use a cotton towel - it frizzes the hair. ??? Use a T-shirt! Then there's "plopping" - a way of putting wet hair up in a T-shirt. I am doing that after every hair washing now. A bonus is that putting your clothes on is easier without your hair getting bound up in your bra etc. It's a breeze putting makeup on with your hair plopped too! Don't use HOT water on your hair! It strips essential oils from the hair that helps define the curls and reduce frizz. I didn't even know what "defining curls" meant. It just means that instead of the unruly wild mass I had, defining the curls makes them stick together into visible curls. Don't use shampoo with sulfates in them. It also strips the oils as above. Don't use products with silicone in them, they require sulfates to wash out. Don't use products with any kind of alcohol in them. They also strip the oils. You don't even need to use "shampoo" - the "no-poo" movement. Basically, because of the undesirable effects of shampoo on curly hair, many now "wash" with conditioner - "co-wash". There are some cleaning agents in conditioners too and enough to do the job for our kind of hair apparently. I'm currently using a sulfate free shampoo, but will experiment with co-washing once I get a handle on this and my hair settles down. Curlies should only wash about once a week. With dryer hair, they don't get as greasy looking and it's gentler on the hair to "wash" more seldom and the oils are good for the curls. I do get oily at the temples after three days. One person counseled to THINK about your hair and what you're doing with it/to it. Don't treat it like a wig. It's your hair and curlies need deliberate, special care. I plan to use only water soluble products. My goal is no sulfates, no silicone, no alcohol. This way I do not have to use shampoo if I don't want to and they are more gentle to hair. Many of these products can be "reactivated" simply by re-wetting and scrunching with a T-shirt the next day. Have the T-shirt arranged on the counter to plop when ready. Have sulfate free shampoo, or conditioner if you are washing with it and a wide toothed comb (just in case) in the shower. Get in and wet hair. You can carefully squish the hanging hair too if you like, to work the shampoo/conditioner through it. Like the scrunching motion. Then I use a very small amount Tresemmé Naturals Nourishing Moisture Conditioner and all the tangles practically slip out by them selves! Even better, it's under $6 for 25 oz!!!! Just such a small dab works like magic! I don't thoroughly rinse it out so I keep that amazing moisturizing. Squish into hair with your hands in sort of a scrunching motion. You should hear a "squish" sound. Consciously, deliberately, carefully work your fingers through the hair from tips to roots, detangling as you go. As a last case alternative, use the wide toothed comb. What do you do with the shed hairs that end up everywhere? I stick them to the shower wall in a glob to collect them and save my shower plumbing. I also put an inexpensive cover over the drain that's designed to catch hair. It was $10.49 at Target. When I get out of the shower, I get a square of TP to easily remove the hair I've collected, from the wall and the drain, and put them in the trash can (my plumber says never the toilet!). When it's detangled, I use a claw clip and without coiling, twisting or anything I would have previously done, I put the clip half way down the length of my hair and then clip it to the top of my head to keep out of the flow of water while I bathe. I have not created any new tangles, but this keeps it out of the water as I finish my shower. Now is when I wash my body, shave, everything non-hair that is needed. It may sound odd saying this, but I didn't find one video laying it out. This is working for me. And while I do this, the water dripping from my hair isn't a problem, falling in the shower. I normally apply my Curl Keeper in the shower, just before getting out, but sometimes after I get out. Apply generously from roots to tips. Squish into hair with your hands in sort of a scrunching motion. You should hear a "squish" sound. I plop my hair in the T-shirt then dry my body and dress. Before plopping, apply any other styling products you want. I am currently using Marc Anthony's Curl Envy. I use a shockingly small amount (given the length of my hair) and it forms a nice cast. Once dry, I scrunch it a couple of times to break the cast and it's soft and happy. Finger comb and scrunch into the hair, hearing the "squishing" sound to distribute it evenly. After I apply the styling product, I scrunch and hold five seconds letting all the excess drip into the shower or sink. I do this all over my head until it stops dripping. Plopping is as simple as picking a long sleeved T-shirt, laying it on the counter/commode with the neck closest to me. With my hair over my head, I let it coil onto the center of the T-shirt, then bring the bottom of the T-shirt to the back of my neck and pull the arms around my head and back to the front where I tie them in a knot. It's easy to dress with the hair safely out of the way. It only takes a minute to dress. I leave my plop at least 10 minutes, up to an hour. When I take it out of the plop, I squish/scrunch the hair thoroughly, using the T-shirt. As I do this, I'm continuing to handle my hair thoughtfully and deliberately to keep it detangled. Now I make my part and scrunch a LOT with the T-shirt, holding for 5 seconds to let the curl return to it's natural state. I scrunch with hair over my head and also upright leaning to each side with it hanging down. Everyone agrees that letting it air dry WITHOUT TOUCHING IT WITH YOUR FINGERS (apparently it makes it frizz) is the best thing to do. So hard not to touch it!!! Mine, though thin and fine, takes most of the day to dry on it's own, so this isn't being workable for me. They say you can use a diffuser till the hair is 80% dry and I find out that I've been using a diffuser (blow dryer) wrong for decades! They say to hold it vertically at the bottom of your hair and guide the hair to coil up on top of the diffuser. You do that till it's against your head THEN you turn it on! Low to medium heat and only 30-45 seconds! Then TURN IT OFF and pull it away from hair. WHO KNEW????? Really? Who knew? What a difference it makes! Even using the diffuser, it takes half a day for my hair to dry and that's with TONS of scrunching with the T-shirt. I'm hoping to improve with more practice cause this is a ridiculous amount of time, effort and money to put into HAIR! LOL! When it's dry, flip your head upside down and rub your scalp with your fingertips. I always did this part. It fluffs it and makes it look more natural. If the top is flat, I got Roller Ball Clips that you clip across your part and wherever you want on your head and leave for just 10-20 min. They even help when the hair is dry. I have learned that sometimes they make undesirable effects that I then have to dampen and scrunch again. I have so little hair that they don't work fantastically on my wet hair, but better on it dry. I have better results using a mini version of the Diva Clips. They are HUGE! My thin fine hair couldn't handle them at all. Even the Roller Clips want to lay flat on my head (due to lack of volume). So I got the old fashioned pin curl clips and use them the same way as the Diva Clips, to lift the top of my hair from the roots. I use them for the last little time of drying, not the entire time. It's tricky removing them as the hinge part wants to tangle in my curls and that kills them. Slowly and carefully!!! Any section of hair that isn't curling nicely, I just re-wet with my fingers, curl around two fingers, then I wrap my towel around my fingers and squeeze to absorb the moisture before releasing the curl. Voilá! I will say that I'm shocked at the difference in my hair after just a month of this new regime. I guess I've been handling my hair type wrong all my life and now that it's even curlier, the crisis brought me to where I should have been all along. I could have had much lovelier hair all along, had I known. On the down side, it was so much cheaper only using a cheap shampoo and conditioner and occasionally a spritz of spray rather than all these products and none of them cheap! It was also almost no work vs this life-consuming regime. I had always been able to get 2-3 days per shampoo. With the products I first tried with this new curly girl thing, I had much nicer day 2 and 3 hair with minimal refreshing. Mostly I just got up, flipped it over my head, rubbed my fingers against my scalp to fluff, then moistened and scrunched a very few strands around my face. I've literally spent several hundred dollars buying products suggested by video tutorials and that comply with the lengthy list of "do not use products with these ingredients on your curly hair!". I guess it's like they said, every curly hair is different. Experiment and see what works for you! I have ruled a lot of products out and settled for now on these. Now as you look at these "after" pictures, be merciful remembering I'm wearing LOTS of layers of clothes as it's COLD in here!!! :) Hey, that's my "plopping" T-shirt drying in the background! LOL! Isn't God great??? 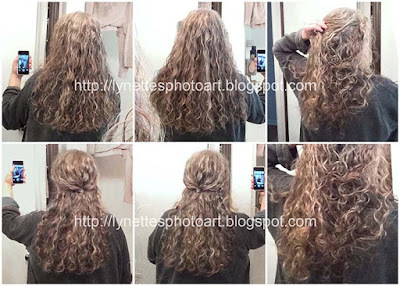 Even though I have thin fine hair, by His giving me the curls, it looks like I have SO MUCH more than I really do! Thank you God!!!! Really! I can't believe all that's natural! A lifetime of thinking I had yuck hair when all I had to do was know how to care for it! I'm pulling the top aside to show you how much curlier it is underneath, but now even the top is curly! :( It's not to my waist any more since the "hairmare" :( But it will grow again! When it's wet, it's still past my waist. After the hairmare, for a while I frequently had smaller mats try to form at my neck. I sprayed them with water, then detangler and worked a small amount of conditioner into it. They came out pretty easily that way. Now that I'm using the Tresemmé conditioner, that never hasn't happened again! And I'm overjoyed to tell you that I can easily divide my hair into three sections to braid for sleep now! When some people braid their hair then take it out later, it's all weirdly bent. I find that loosely braiding my hair now does not change my curl pattern at all. I take the braid out, fling it over my head, rub my fingers on my scalp to fluff it and it's just like it was before braiding! I even tried sleeping with it all on top my head on one of those fat bendy curlers. I use three huge bobby pins to secure it to my head as the weight of it was pulling my hair when I laid down. No problem with the pins. My hair was dry when I put it up and it looked no different in the morning at all. It also had no tangles and the curls looked just like the day before. I found it uncomfortable and made sleeping difficult. So, if you are aging and getting the surprise of your life waking up with felted curly hair, know you aren't alone! And if you're just now learning how to take care of the hair God gave you 61 years ago, well you aren't alone on that one either and it's a hoot! I hope this information has helped and saved you the days of searching the net for answers that I put in. Thanks for dropping by, and reading till the end!!! God bless you and yours this new year! An important development was finding EWG's Skin Deep website and then their free app. They collect the ingredient data for countless products and rate them 1 to 10 for safety based on the ingredients. They give you ratings for three categories: cancer, developmental/reprotoxicity and allergy. That's awesome because many times they show a "low" risk for the first two and a "high" risk for allergy. Well, if I've used it a long time and had no reaction, I feel I can ignore that number. They show you which ingredients are of concern too, rating them. It's pretty awesome! I had noticed some of the new hair products I was trying printed in the directions to "wash hands after use". I thought that odd, but innocently didn't put it together that there were scary things in it. Boy do I wash after doing my hair now! All around it's been eye-opening and a bit jarring. I scanned all the health and beauty products I have. They didn't have all of them listed, but say now that someone scanned them, they will look into it. I found I'd been using a product rated 9 out of 10!!! No more! Things I'd never have thought of being a risk, like my Ultra Calming Makeup Removing Wipes, rated a 6. Very unsettling, I found that the L'Oreal Mineral Makeup powder I've used for YEARS, the first makeup I put right on my skin, is a 7! Now I use the app to scan products at the store before purchasing them. It's very helpful. Thank you EWG!!!! !